This entry was posted in Uncategorized and tagged bikes, english, infrastructure, london, video on Fri 14 Feb 2014 by kevin hickman. Wow, that’s amazing. I’m astonished that nearly every bit of infrastructure that’s described exists today in exactly the same form (and I can hit most of them on my way home!). The weird junction onto Waterloo Bridge that must be the only one where you get a green light, but can’t proceed…. I’ve only really been riding in London for a few years but it does appear that not much has happened since then, with this being a notable exception, and I had no idea that that route south from Paddington was called the Ambassadors Route. And yes, no specific bike clothing to speak of apart from a couple of club jerseys and a Sam Brown belt. Quite a few kids too. Well, that made me feel nostalgic, dismayed and old, all at the same time. I started cycling to work in 1986, at the time, I was working at The Royal Festival Hall and cycled from Eltham and back. As a previous poster has already stated, not much has been added to the cycling infrastructure in the last 30 years but I’m sure more would have been done if the GLC hadn’t been disbanded by Thatcher. 30 years on and I’m still as keen a cyclist as ever, however, know enjoy the virtual traffic free roads of France. 1984 and not a mountain bike in sight! I particularly like the chap demonstrating the Ambassador Route when he crosesg Bayswater Road at 16:10 – he starts to cross to Hyde Park on a green cycles-only light and nearly gets sideswiped by a car speeding towards Marble Arch. Having cycled as a dispatcher in 1984 I don’t see much difference to riding around today. Still lots of cars, buses, lorries and cabs – what’s really new? Too many people want to abdicate any responsibility for their own safety. Considering we’re riding around on two skinny little wheels in a sea of heavy metal boxes with limited vision and a multitude of other distractions, it is really down to us. And why do people want to make political? What GLC leader ever rode a bike? 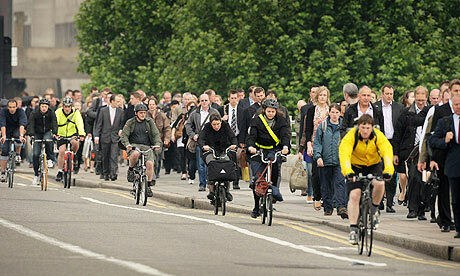 Yes, things are better today – but only because more people cycle and the weight of ‘noise’ is greater. But I think I preferred it in 1984 when no one really complained and the traffic was even worse.